University of North Texas Press, 9781574415254, 336pp. Winner of the Army Historical Foundation Distinguished Writing Award, 2014. Selected by General Raymond Odierno, 38th Army Chief of Staff, for the U.S. Army Chief of Staff's Professional Reading List, February 2014. Pacific Blitzkrieg closely examines the planning, preparation, and execution of ground operations for five major invasions in the Central Pacific (Guadalcanal, Tarawa, the Marshalls, Saipan, and Okinawa). The commanders on the ground had to integrate the US Army and Marine Corps into a single striking force, something that would have been difficult in peacetime, but in the midst of a great global war, it was a monumental task. Yet, ultimate success in the Pacific rested on this crucial, if somewhat strained, partnership and its accomplishments. Despite the thousands of works covering almost every aspect of World War II in the Pacific, until now no one has examined the detailed mechanics behind this transformation at the corps and division level. Lacey examines the Smith vs. Smith controversy during the Saipan invasion using newly discovered primary source material. Saipan was not the first time General "Howlin' Mad" Smith had created friction. Lacey reveals how Smith's blatant partisanship and inability to get along with others nearly brought the American march across the Pacific to a halt. 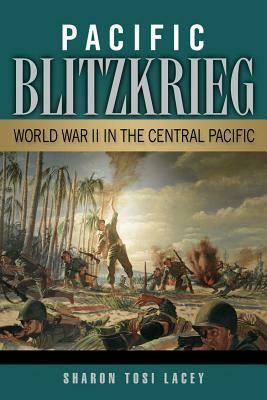 Pacific Blitzkrieg explores the combat in each invasion to show how the battles were planned, how raw recruits were turned into efficient combat forces, how battle doctrine was created on the fly, and how every service remade itself as new and more deadly weapons continuously changed the character of the war. SHARON TOSI LACEY earned her PhD in military history from the University of Leeds, and is also a graduate of the United States Military Academy and Long Island University. She has served as a U.S. Army officer for more than twenty-two years and published more than thirty articles on military issues in magazines and journals. She lives in Northern Virginia.